Historically, water treatment systems, whether municipal or industrial, have had minimal instrumentation and little in the way of automatic diagnostics. This is partly because treatment methods have changed slowly over time. In fact, the basic sand filter is essentially the same as when Sir Francis Bacon described one in the 1580s! Now, however, automated control systems are the norm in water and wastewater treatment plants. Manual monitoring, run to failure, and downtime, are expensive, and can be dangerous. It is simply too expensive to have operators walking around the plant, or driving from station to station all day long, inspecting systems and looking for problems. In recent years, OEM builders and control system integrators have begun supplying fabricated, skid mounted treatment modules to water and wastewater treatment facilities, particularly in industrial plants. These plants include everything from power plants (boilers and cooling towers, drinking water and wastewater) to hospitals, golf courses, industrial plants (boilers, water treatment, process water supply, and discharge systems) to large buildings. Even smaller municipalities have returned to purchasing “packaged” treatment plants from an OEM rather than having a consulting engineer design and engineer-constructor build custom plants on their sites. Pulling a skid mounted treatment plant off a lowboy trailer and sitting it down on a concrete pad is much easier and less costly than a “stick built” plant could be. The OEMs who build and install these systems have a responsibility to help their customers maintain and repair their machinery. Sometimes they do this under warranty, and sometimes they do it as a fee-for-service operation. In either case unplanned service calls can be extremely expensive and time consuming. This expense and time consumption can be costly for both the OEM or system integrator and the end user of the packaged treatment module. For example, a failure of an OEM reverse osmosis system may take down an entire pharmaceuticals plant because there is no water supply of the required purity. Similar examples can be found for most applications in nearly every industry vertical that uses water. Here is where point diagnostics on the I/O and on the pneumatic valves (all of it available over Ethernet) can provide both OEMs and end users a large cost savings. By implementing the diagnostic capabilities that already exist within the components that comprise the plant, two benefits can be realized. First, remote troubleshooting is possible if the control system is connected to the Internet, allowing fast, easy troubleshooting assistance from a remote engineer. Second, detailed, instant, information about errors and error related trends could be presented to local operating and maintenance staff, if the diagnostics systems are implemented correctly. If the correct components are specified during design, these benefits can be realized with little, or no, additional cost to the project. The shortage of trained and qualified operations personnel has impacted the water and wastewater treatment sectors just as much as it has the rest of the process manufacturing industries. Salaries have risen, headcounts have come down, and automation is increasingly being used to substitute for monitoring and control directly by operators. This shortage includes trained maintenance technicians, and requires not only automation of complete systems but as much diagnostic information as can be obtained from the system. Systems are being designed from the ground up to be highly automated, with diagnostic information from nearly every component in the system, from valves and actuators to digital, pneumatic, and electrical I/O modules, to control cabinets and HMI stations and controllers. With increasingly limited resources, both small municipal and industrial water and waste treatment projects are being designed and constructed by OEM skid builders who provide turnkey systems from inlet to outlet. Generally, these OEMs provide warranty and after-warranty service for the systems they construct. To do this economically, this has led to the growth of regionally based OEMs who can be relatively local to their installed plant base. Economies of scale, however, are producing higher volume OEMs who are located sometimes quite far from their customers. As regional OEM skid builders become larger and cover bigger sales territories, providing field service becomes increasingly problematic. When an industrial water treatment module goes down due to equipment failure, the end-user or asset owner may be faced with a plant shutdown. A municipality may be faced with the lack of sufficient water to handle mandated fire flow capabilities. The OEM must get the plant operating in as short a time as possible. This is difficult, and often quite costly, if the OEM technician must travel several hours to reach the plant site before beginning to troubleshoot and repair the system. The technician may find that the required parts and systems aren’t what are on hand, and there may be additional delay while those parts are sourced and brought to the plant site. All the while, the plant is down, the process or municipality is without adequate water, and the asset owner is becoming increasingly angry. Traditional field service modes simply do not work in today’s marketplace. Plant control systems are increasingly complex. Water filtration systems can no longer be operated by semi-manual means. Unattended operation capability for long periods of time is a required design parameter. This entails the use of more analog instrumentation such as flow, level, and pressure sensors. Unattended operation requires more complex controllers with sophisticated software and increased connectivity to the Internet. Unattended operation requires more automatic pneumatic actuation for control valves rather than depending on manual operation of valves. All of this means that as the number of components increases, the failure modes also increase. Each component is a potential point of failure. When troubleshooting a system, each component must be checked and cleared to determine what the actual cause of the failure is. This can use up a lot of expensive technician time, even when the technician is highly trained and experienced. The solution must be to provide components that can report issues for themselves, so that the technician can easily determine and correct faults. More important, the level of connectivity from the component level must be sufficient that an OEM can perform remote diagnostic checks and diagnose component failure from their offices before they arrive on site to repair the system. This way, the technician arrives with replacement parts and subsystems already in hand, shortening the time necessary to troubleshoot and get the system back on line. For most of the past two decades, designers of industrial control components have been concentrating on standardizing the interfaces to them, and making the components themselves smarter. It is substantially easier to troubleshoot a component, be it IO or a controller, or a valve actuator, if it can report what is wrong with it. Every fieldbus since Modbus has as its most important feature the ability to carry not only the Process Variable (PV) but also other computed variables and a complete set of diagnostics. For the OEM, the fact that the components used in the skid mounted water treatment module can report when they are not working properly, and in some cases, report why they aren’t working properly, saves money, technician time, and can produce repeat business based on the efficiency of maintenance and repair of the system. It is difficult to imagine that a designer at an OEM of water or wastewater treatment systems would deliberately select components that do not have onboard diagnostics over components that do, especially since equipment that offers these features often costs the same as similar equipment that doesn’t. There are two best practices that OEM equipment designers should use to make sure that their packaged treatment modules have the most capable diagnostic features available. First, designers should minimize exposure to risk by using only a very short list of suppliers for components. 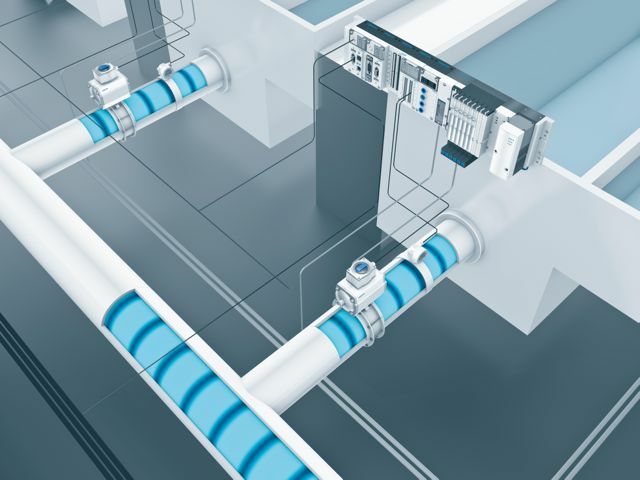 Another fairly commonly used best practice is to select a company like Festo that can provide most of the components necessary for automation of a water or wastewater treatment package plant. In some cases, companies like Festo will be willing to act as a Main Automation Contractor, providing control panels, wiring enclosures and IO cabinets as well as the individual automation components. Selecting a company that can provide most of the components means that incompatibility in diagnostic packages does not occur, makes FAT and SAT easy to accomplish, and permits easier maintenance than trying to select components one at a time. Selecting a company that can act as a complete single source for all the automation on the packaged treatment plant minimizes risk and maximizes the ability of the OEM and the end user to keep maintenance and troubleshooting costs to a minimum. Second, designers should make sure that the components they select have the most diagnostic features they can buy. Most of these components, such as controllers, IO modules, actuators and the like, are priced competitively with components that do not provide diagnostics or only provide a minimal set. These detailed diagnostics are needed to make remote troubleshooting easier for the OEM and easier for the end user. As an example, Festo’s design features “on the spot diagnostics.” This includes color-coding valves and LEDs, which the simplify troubleshooting, and in the case of water treatment for pharmaceutical plants, makes validation easier as well. Festo’s on the spot diagnostics include under-voltage monitoring, fieldbus status, controller and I/P transducer status, module specific diagnostics, and valve specific diagnostics and solenoid coil status. Short circuit detection for transducers, outputs and valves is supported and open load detection finds missing solenoid coils. Festo’s CPX terminal has on-board history, which can store up to 40 error events with timestamps for start and end of event. Diagnostics aren’t worth much if you have to be present physically to read and interpret them. Companies like Festo provide a variety of remote diagnostic applications ranging from handhelds to laptop software to fieldbus and integrated Ethernet interfaces so that the diagnostics can be read out remotely and historicized and used to direct maintenance remotely via the control system or Web-based asset management applications. Diagnostics like the ones included in Festo products can be imported into the most common Asset Management software packages. These asset management packages typically include software for calculating preventive maintenance schedules, predictive maintenance strategies, and determine replacement times to keep plant shutdowns to a minimum. In the ideal case, the diagnostic alarm on the component should automatically generate a work order to repair or replace the component before complete failure occurs. The OEM can then use the diagnostic data remotely to improve on-site maintenance and response time, reduce trips to the plant, and save money for both the OEM and the end user. By selecting the proper equipment and instrumentation in the first place, the OEM, machine builder, or system integrator, can set the packaged water or wastewater treatment module up for implementation of remote diagnostics. This will make remote service and troubleshooting less costly and less time-consuming, and provide better service to the end user. For general information on Festo, call 800-993-3786, visit http://www.festo.com/us, or write us at customer.service@us.festo.com. For information on process automation, visit www.festo.com/us/processautomation.